Archer is an animated, half-hour comedy that revolves around an international spy agency and the lives of its employees. Although their work of espionage, reconnaissance missions, wiretapping and undercover surveillance is daunting and dangerous, every covert operation and global crisis is actually just another excuse for the staff to undermine, sabotage and betray each other for personal gain. 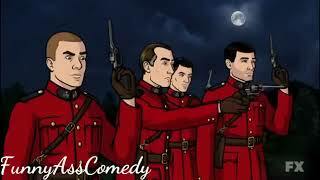 The series features the voices of H. Jon Benjamin as the highly skilled and incredibly vain master spy “Sterling Archer;” Aisha Tyler as Archer’s fellow agent and ex-girlfriend “Lana Kane;” Jessica Walter as Archer’s domineering mother and the director of the agency, “Malory Archer;” Chris Parnell as the easily intimidated comptroller-turned-agent “Cyril Figgis;” Judy Greer as Malory’s loquacious secretary, “Cheryl;” Amber Nash as the discordant director of human resources, “Pam Poovey;” Adam Reed as the gay voice of reason, “Ray Gillette;” Lucky Yates as the agency’s possibly mad scientist, “Krieger;” and George Coe as Archer’s elderly and always exploited butler, “Woodhouse.” An FX Networks Original Series.